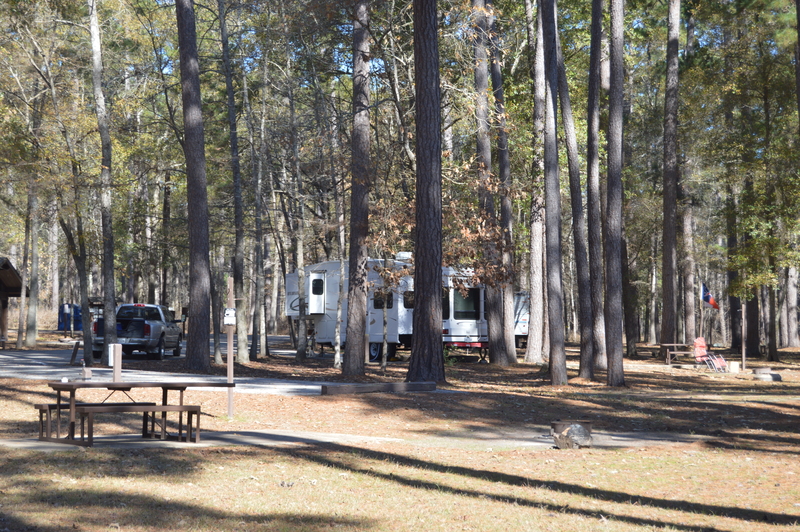 We finally arrived at Sam Houston National Forest after some re-scheduling. 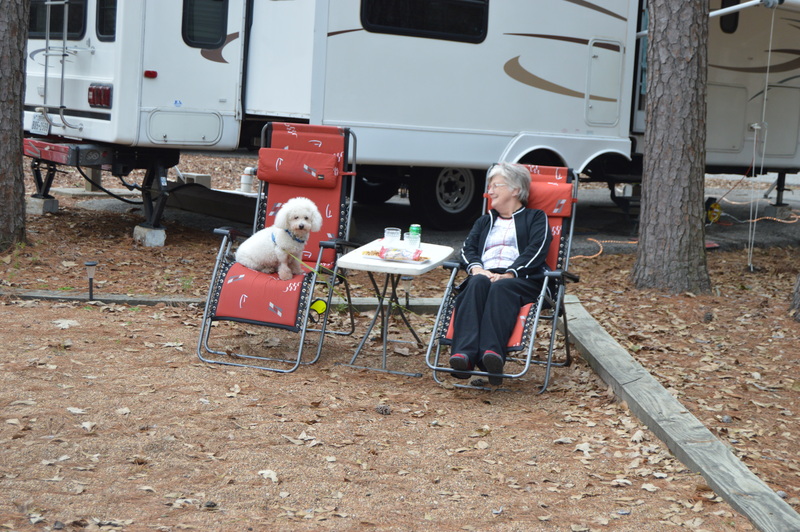 We arrived on a Saturday afternoon at the Cagle Campground. Fortunately we had our reservations in advance and a site was waiting for us. Week-ends are busy this time of year at the parks in this part of Texas. We really should get Phil a red chair too! We were ready for the quiet and relaxed atmosphere. A boat ramp and dock is at one end of the campground. It was a favorite spot for fishermen of all ages. Wood smoke was in the air with many campfires at various sites. Families roasted marshmallows and chatted about the day’s events. Since we are parked near the shore of Lake Conroe, there must have been a few fish stories going around. By Sunday night, it had thinned out and the atmosphere was even more serene. We built our own campfire and cooked our dinner outside for the first time in months. We had steak, corn on the cob, scalloped potatoes with rutabaga and a salad. We wanted to try out the new Fire Spit that we received as a gift at Christmas, but we were not able to find a whole chicken at the small town of New Waverly. We will do this menu at our next fire ring. 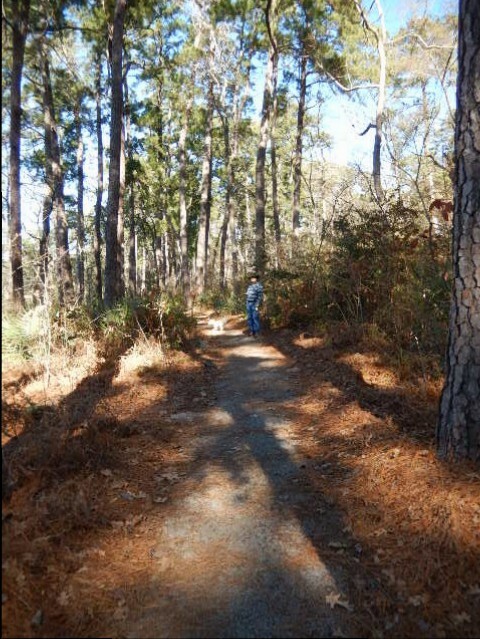 We took advantage of the sunshine that has been scarce for a while and walked a few of the trails in the park. We enjoyed observing the many different species of birds that are in the forest. They were small and fast and of course we were not camera geared for them. This is something more to learn to pack in the backpack; cameras and binoculars. Everything in the park appears to be well maintained and tidy. However, we did not give up our afternoon naps, we just slept a little harder. The exercise is good for us. The camp hosts were friendly and helpful. Bathrooms clean but unheated, this is the forest after all. We would like to return for a longer stay during the week. We have looked at this campsite online. Not too far from Houston where our family is. Sorry to hear Phil had the flu. We have missed it so far. Love your stories and looking forward to reading more. Thanks Linda, we enjoy hearing back on our posts. This is a great park but you do have to reserve online. I hope that we see you on the road sometime!